Lost children have a strong grip on the national psyche, as documented by Peter Pierce in The Country of Lost Children: An Australian Anxiety (Cambridge University Press, 1999), reaching from the 19th century to the present in fiction, film, painting and real-life. Pierce could have more accurately written “White Australian Anxiety” for a phenomenon generated by settlers’ fear of an alien landscape. Angela Betzien’s The Hanging perpetuates the anxiety while Andrea James’ Winyanboga Yurringa returns Aboriginal women to country hitherto lost to them and in doing so suggests, in turn, that endangered young women’s lives need not be lost. Both are conventional plays, but the originality and, for white audiences, unfamiliarity of James’ vision makes it a special experience. Winyanboga Yurringa is Yorta Yorta for Women of the Sun, the title of the four-part TV mini-series Women of the Sun (1981), co-written by Hyllus Maris and Sonia Borg, which inspired James to write, as she explained in a recent RealTime interview, about a new generation of Aboriginal women. Winyanboga Yurringa opens and closes ritually. Initially a lone female elder bearing a ceremonial digging stick stands astride a small circular rise and finally a teenage girl is dressed in the centre of a sacred site with traditional female attire. 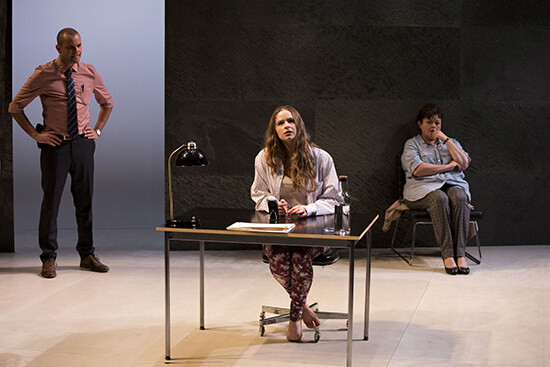 In between, the play is an ever-darkening comedy of conflicts between six very different Aboriginal women as banter turns bitter and anger and despair threaten to take hold. Below the rise is another circle—camping space and sacred site—girded above by a semi-circle of exquisite suspended sculptures and several in the distance, from which hang curled, leaf-like shapes. Transforming dramatically with the play’s mood shifts they suggest a magical place, of serenely floating trees that can become eerie presences. The elder, Neecy, has invited five women to the site with a purpose (something to do with the contents of a large box) but is thwarted by joking and bickering, Carol’s need for alcohol and her fear of spiders and snakes, the teenage Chantelle’s urgent desire to call her exploitative boyfriend (reception’s too weak) and tension between two sisters—Margie, a lesbian with a white girlfriend, and Wanda, a mother of six with an abusive husband and a dislike for anyone insufficiently ‘black.’ A late arrival, Jadah, a pale-skinned photographer becomes the perfect target for Wanda’s prejudices which she relays with relentless hostility: “do you make art for white people;” “why does she want to be a blakfella now?” That Jadah has made an artwork in which she has her family paint their faces black (as Bindi Cole, the AV artist for this production, did in a controversial photographic series) unsettles the whole group. Neecy manages to corrall the women from time to time: they weave long grass, sing “Pretty Woman” rawcously, joke non-stop from the outset—“you can’t go wrong with a small businessman”—and conjure a scary spirit, but increasingly share moments of sombre insight: “If not for grandmother weaving in the dark, we wouldn’t be weaving in the light,” and they rally to defend Jadah. A greater problem is the vulnerability of Chantelle with her mother in gaol, no job and, as she says accusingly, “you all argue.” Rejected by her money-demanding boyfriend (reached on Jadah’s phone), she wanders into the night and is assumed lost, causing panic (and some funny business about Aboriginal people using GPS). But her carer, Neecy, knows that the absence of a sense of belonging could lose the girl to drugs and a pointless life. Chantelle’s return is nonchalant but coincides with growing conciliation between the women. At last, through ceremony, Neecy can make these individuals one, with a place at their centre for Chantelle. From the box come items of traditional adornment (bravely “borrowed” by the usually cautious Carol from a museum archive) with which to dress an accepting but slightly bemused Chantelle in the manner of her great, great grandmother. Once lost, she is now found, if symbolically, but with great hope. Winyanboga Yurringa is a work of great feeling, fraught with tension, leavened with laughter and racked with gut-felt anger. Tessa Rose brings stately authority and determination to the role of Neecy. Pamela Young is a gently funny, unsettled Carol; Kylie Coolwell an unfussed, benign Margie who sees though her sister’s anger; and Alexis Lane’s Chantelle a wounded adolescent, played with just the right reserve. 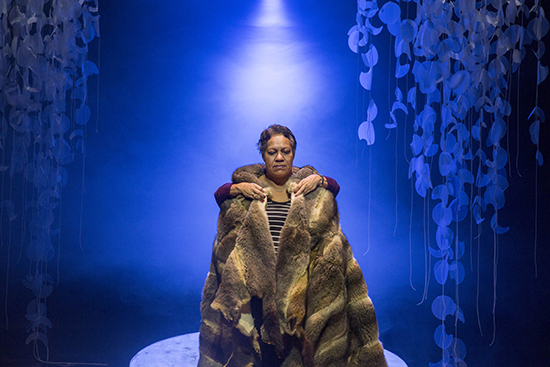 Matilda Brown’s sensitive Jadah is initially scared off by Wanda but grows in strength. And Angeline Penrith’s portrayal of Wanda, racist against her own people, played without exaggeration, is consistently unnerving. Her anger could undo this fragile community of women, but their coming together on country finally does its magic. Andrea James has drawn a variety of talents together for a perfect ensemble performance. Designer Daniele Hromek’s ‘tree’ sculptures make her set a work of beauty, given colour and depth by Karen Norris’ superb lighting, Bindi Cole’s haunting projections and an aural depth of field created by Phil Downing in which, instead of a conventional composition, an array of wonderful, highly articulated sounds evoking nature and the night have been scored to amplify the immersiveness of the setting and a sense of very special country. With wit and passion, Winyanboga Yurringa generously invites us into a world of Aboriginal women in search of heritage, belonging and spiritual unanimity, a rare and treasured offering. 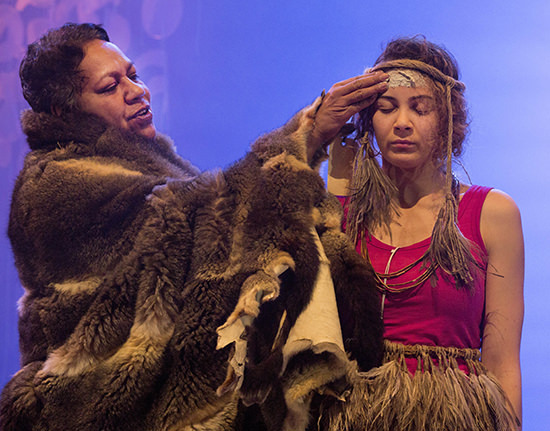 Winyanboga Yurringa plays 17-20 August at the Playhouse Theatre, Geelong Performing Arts Centre. At a time when crime fiction devotees are steadily fed with television series and novels of great depth and complexity, Angela Betzien’s STC commission, The Hanging, proved to be an entirely frustrating procedural, short on logic, insight and suspense. Three 14-year-old students in an all-girls private school have gone missing. One of them returns, tight-lipped, to be interrogated by a young detective sergeant (Luke Carroll), at first out of his depth in dealing with a sulky, snarky adolescent (Ashleigh Cummings) and the girls’ droll teacher (Genevieve Lemon) who had introduced the trio to Picnic at Hanging Rock and other novels in private sessions at her home, feeling that the school had become authoritarian (after another mysterious event) and that the girls needed a sense of freedom. A long, slow stretch of getting nowhere is broken when the detective suddenly reveals a pile of evidence he had all along, girl and teacher turn on each other and revelation is in sight. Save for a few of the teacher’s witticisms, the dialogue is dull underlining the absence of serious characterisation—the detective is nothing more than an earnest policeman and family man, the girl, a real pity, is allowed limited psychological complexity and the teacher, in love with one of the missing girls, borders on cliché. The conceit of updating Joan Lindsay’s 1967 novel Picnic at Hanging Rock, shorn of its supernatural dimension, is laboured, having to do work not done by the script. Projections on a wide screen atop a ground-level long stone wall periodically show the girls wandering through deep forest right up to the climactic reveal, overtly recalling imagery from Peter Weir’s 1975 film. The found girl appears on top of the wall in the director and designer’s awkward attempt to integrate live performance and film—with melodramatic consequences. Other reviewers of The Hanging were uniformly gripped and thrilled, but I couldn’t engage with a play that is too casual with procedure to be suspenseful, seriously evasive about what would drive young girls to an extreme fate and relying on associations with the novel and film without suggesting anything more than an impressionistic updating.